The indicators provide a measure of the common features of higher education institutions as well as their diversity. They also reveal some aspects of the student experience at higher education institutions and assess the performance of institutions in several areas which are relevant to the core purposes of higher education institutions. Other indicators, particularly those related to the financial performance of institutions, attempt to gauge the resources available to institutions. IT-Blocks has developed a Data Warehouse model to integrate data from faculties and universities to produce an OLAP front-end application reporting the Higher Education Key Performance Indicators analyzed on different dimensional levels. The Saudi National Commission for Academic Accreditation & Assessment has issued many requirements for eligibility for accreditation of both academic entities and programs. IT-Blocks has extended its offering to cover the accreditation needs of universities and for the need to comply with NCAAA for accreditation by proposing a new solution called Quality Assessment and Accreditation System (QAAS). QAAS is specially developed for Saudi Universities to help them comply with NCAAA accreditation requirements. QAAS natively integrates with the IT-Blocks Higher Education Key Performance Indicators model, thus providing an integrated full solution for Quality and Performance monitoring. Furthermore, having noticed that one of the most important tools for quality measurement in Universities is conducting Surveys, IT-Blocks has also integrated a Survey Management System with QAAS, to facilitate for universities conducting surveys and having their results as proof for their quality assessment. This technical solution description is prepared for University to provide and implement a full solution including QAAS, the IT-Blocks Higher Education Key Indicators system and the Survey Management System in addition to providing consultancy services for implementation, transition and rolling out. Each of these systems covers the main area while, integrated, all three of them provides a full solution for quality and performance monitoring in addition to helping qualify University for NCAAA accreditation requirements. Our proposed solution also includes implementation services for the three systems as described below in addition to a description of required HW infrastructure. Moreover, the proposed solution includes the optional supply of a professional certified BI consultant for one year after the end of the project to supervise the rolling out of the solution. 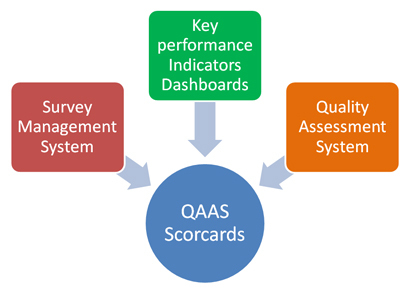 The Above diagram illustrates how the three systems are integrated into QAAS Scorecards that form a one point of access for managers to monitor performance and access detailed information if required. Following, there is a detailed description of each of the systems and their modules.